Wacken Winter Nights 2019 will take place in Wacken, Germany on February 22-24, 2019. 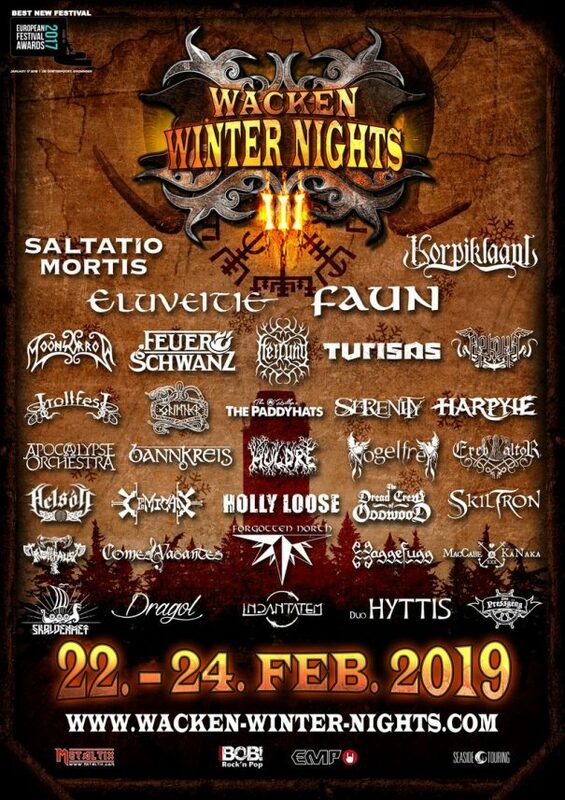 Eluveitie, Moonsorrow and Korpiklaani are among the bands that will perform at Wacken Winter Nights 2019 festival. Meh Suff! will take place in Hüttikerberg, Oetwilerstrasse 81, 8115 Hüttikon, Switzerland on September 8-10, 2017. Memoriam, Moonsorrow and Solstafir are among the bands that will perform at Meh Suff! festival. Leyendas del Rock 2017 will take place in Villena – Alicante, Germany on August 9-12, 2017. Megadeth, Sabaton and Amon Amarth are among the bands that will perform at Leyendas del Rock 2017 festival. Midgardsblot Metalfestival 2017 will take place in Birkelyveien 9, 3184 Horten, Norway on August 17-19, 2017. Sólstafir, Unleashed and Aura Noir are among the bands that will perform at Midgardsblot Metalfestival 2017 festival. Dark Troll Festival 2016 will take place in Bornstedt, Germany on May 05-07, 2016. Moonsorrow, Graveworm and Fen are among the bands that will perform at Dark Troll Festival 2016. Durbuy Rock Festival 2016 will take place in Bomal-sur-Ourthe, Belgium on April 08-09, 2016. Pentagram, Primordial and Moonsorrow are among the bands that will perform at the Durbuy Rock Festival 2016 festival. 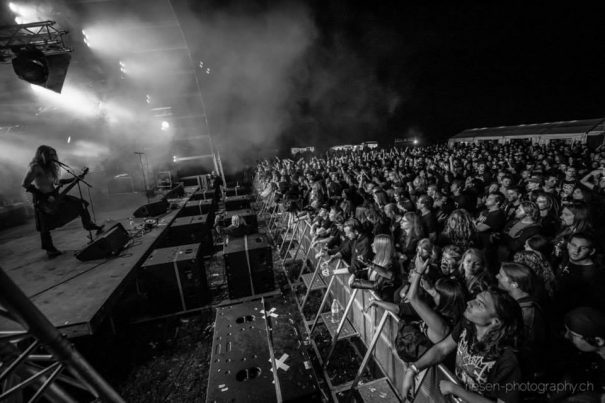 Dokk’em Open Air 2015 will take place in Dokkum, Netherlands on August 18-20, 2015. 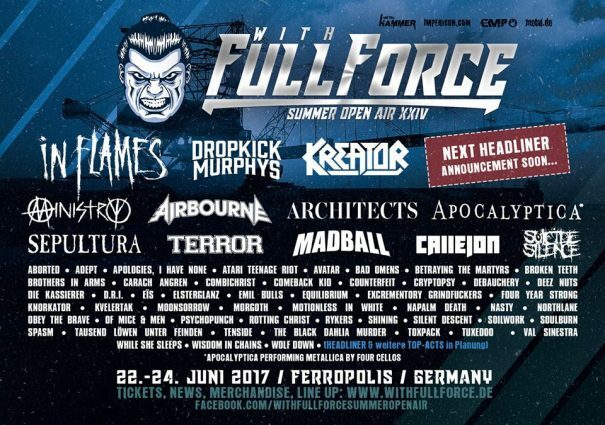 My Dying Bride, Candlemass and God Dethroned are among the bands that will perform at the Dokk’em Open Air 2015 festival. Nummirock 2015 will take place in Nummijärvi, Kauhajoki, Finland on June 18-20, 2015. Arch Enemy, Dark Funeral and Testament are among the bands that will perform at the Nummirock 2015 festival. Satyricon, Primordial and At The Gates are among the bands that will perform at the Blastfest 2015 festival.